We just began out Cretan holiday!! Go to your vet 2 days before flying so they can stamp your dog's passport to show they have been examined and are fit to fly. Also to take the pills against tapeworm. Airlines charge different amounts for transportation of animals. Again, check with the airline before you book. Sage's carrier cost 140 Euros from a pet shop. I am sure I could have shopped around for a bargain online, but I was pushed for time. Smaller carriers, for smaller dogs, inevitably cost less. The bottom half of her carrier serves as a bed when we are not traveling. This helps her to feel familiar and safe when it comes time to travel. Sage had the microchip implanted as a deal from the animal welfare charity when she was neutered. A quick search online just now showed that prices vary from about 30-50 Euros - you could check with your local animal welfare group to see whether you can get it done more cheaply/for free. 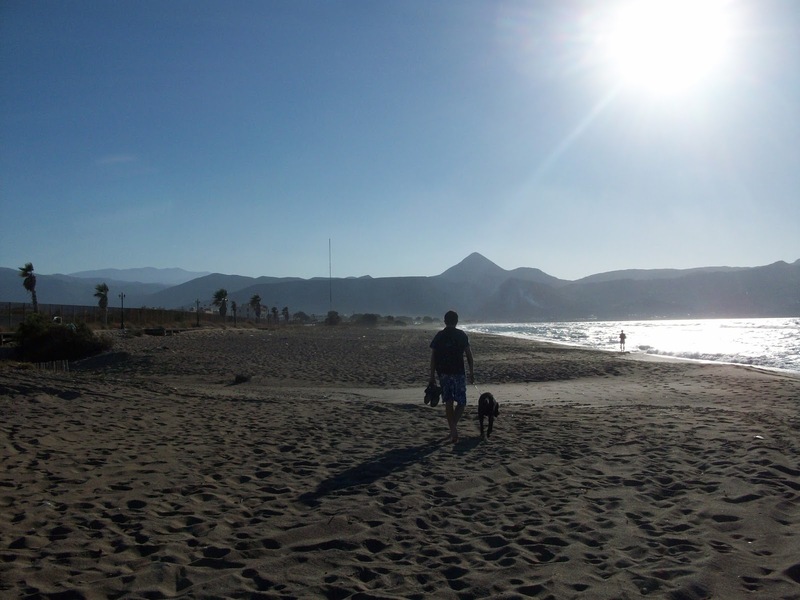 In Crete, I paid 20 Euros for the pet passport, and for the vet to examine Sage and validate the passport. The second time we flew, from Cyprus, I paid 30 Euros just for the check up and tapeworm treatment. These prices depend on the charges of your vet. Finally, the big one, when we flew from Crete to Cyprus at Christmas, Cyprus Airways were charging by the kilo for the transportation of animals. The fees were 7.50 Euros per kilo. Sage weighed in at 30 kilos, plus the weight of the carrier - we paid 280 Euros (one way!!) They have since changed the pricing system, now you pay a set fee if your dog is up to 20 kilos, another fee up to 30 kilos etc. It cost 160 Euros, one way, for Sage and the carrier. We turned up early to the airport, with Sage already in her carrier, and went straight to the check in desk. They re-directed us to a counter that was for people with special travel requirements. We tried to weigh her on the suitcase belt, but the carrier was too big. The staff of the airline just asked us her weight and charged us accordingly. Stricter airlines may make you weigh the animal in front of them. I went to pay at the desk for excess luggage charges (luggage handler for several airlines). We went outside to wait, so as not to check our 'special luggage' earlier than necessary. We made sure she had a drink of water. When it was time, we went to the area where you check oversized luggage. Here we had to take her out of the carrier, so they could scan the carrier. I walked through security with her on the lead. 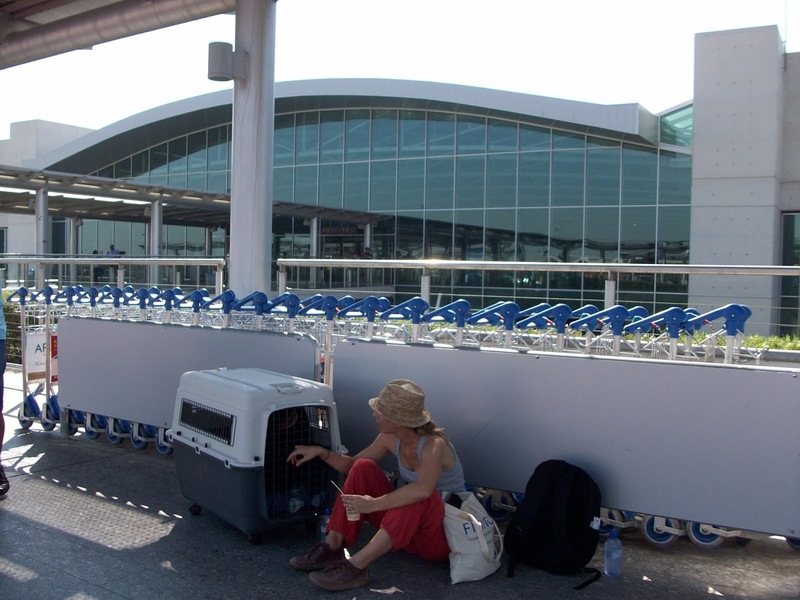 Then I got her back into the carrier (by means of a couple of treats - useful to have with you if your dog is as greedy as mine), and then had to leave her waiting on a conveyer belt to be carried out to the plane. The worst part of all of this was at Heraklion airport, when we arrived in Crete. I suppose this is a hazard of flying in the summer months. There were too many flights landing, chaos in the airport, people pushing and shoving for their luggage, and nobody to ask where to collect our dog. I admit I got in a bit of a panic. There was nobody at the luggage handling desk, and nobody seemed to know anything. Finally, as our luggage started to arrive on the belt, I heard a little bark somewhere close by through the crowd, and she was sitting there in her carrier, looking relieved to see me. You don't need to know that I cried just a little, out of relief!